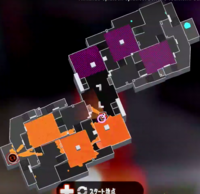 Shifty Station is a multiplayer stage in Splatoon 2. It is only available during Splatfests and has a variable layout. The layout does not change over the course of a single Splatfest. 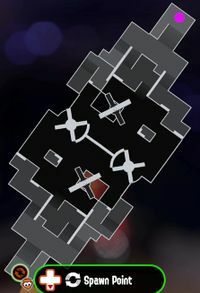 Players spawn on either end of the stage, on raised platforms that lead down to sequentially shorter platforms connected by ramps. To the right is a large open area, and straight ahead is a small passage connecting the two halves of the map. In the gaps between each half of the map are two medium-sized platforms that periodically move side-to-side. A frontal view of the map, seen from a spawn point. The large area right of the spawn point, looking towards the spawn. In front of the spawn point, looking toward the center of the stage. Players spawn on either end of the stage, on raised platforms that lead down to to a central area. There are two small raised platforms on either side of the central area that periodically move up and down, and a large platform topped with a small inkable block in the middle that moves opposite the side platforms. Various walls are placed about the level to use as cover. When this layout was re-used in May 2018, the small inkable block on the middle platform was removed, some walls were repositioned at the canyon of the spawn point and the tall wall near the spawn points became inkable on one side and significantly shorter, while the rest of the layout was identical to the original incarnation. 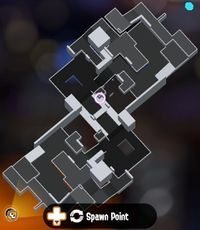 This shifty station contains a third variation that was never used in game. The rightmost corner of the stage, looking towards the center. The center platform, looking towards the spawn point. Team Raph on Shifty Station. Players spawn on either end of the stage, on raised platforms that lead down to to a central area. To the right, there is a raised platform that is accessible via sponge. To the left, there is an Inkrail on an isolated platform that the player can jump to in squid form. Towards the center of the stage are two more Inkrails, which can be used to get on their corresponding platforms. Sponges, walls, and crates in the center area can be used for cover. When this layout was re-used in May 2018, more sponges were added to allow greater movement to key areas. For example, a sponge was added alongside the left side ink rail platform to allow a route to the Inkrail that doesn't involve jumping. Some sponges had their sizes changed, as the centre sponges allowed to get on both towers, and the sponge near the right Inkrail was made into a cube. Also, the crates centrally placed in the platform just below spawn were rotated 90 degrees clockwise. Players spawn on either end of the stage, on raised platforms that lead down to to a central area. Each side has rotating platform that the walls of it can be covered to climb on it and not fall to the abyss. At the center, there's a big wall and 2 uncoverable rotating platforms, and only can be crossed to the other side by going through the rotating platforms. When this stage was re-used during the Sanrio Splatfest tournament, the central revolving doors were skewed with the left one (per player point of view) moved closer to the spawn. The middle has also been opened up, allowing free movement from one side to the other. The right side of the spawn point has also been expanded. To the right of the spawn point, looking towards the center. To the left of the spawn point, looking towards the center. Players spawn on either end of the stage, on raised platforms that lead down to to a central area. 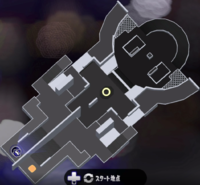 Each side has uninkable ramp near spawn and spinning spreader with their ink color. At the right side of each spawn point there's an area to paint and an uninkable spinning spreader on the wall that leads to bigger platform. At the left side of each spawn point there's long paths that lead to the center where's there's platform with a wall and a box on the left. At the center, there's a large spinning spreader with each team's colors that can be climbed on that stops spinning at the 15 seconds left mark. Middle with the large spinning spreader. Right side of each spawn. 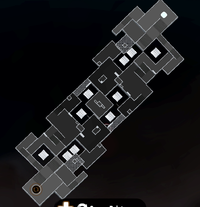 The spawn point for each team is on a raised invisible platform which ramps down to a wider open area. These areas connect via more invisible inclines to a central area dominated by a platform that rises and sinks back into the floor periodically. This platform's walls are also invisible, and each time it sinks into the floor all ink on the walls disappears. To the sides of the central area are two smaller "courtyards", in the middle of each of them is an invisible block with ink-able top flats which is constantly circled by long, flat Squee-Gs, shaped like Spreaders which wipe off all ink (leaving the top inked but cleaning the walls of the block). Looking down at the invisible incline leading down from the spawn point. An invisible wall in front of the team's open area. The same wall, with some ink on it. Overlooking the center area from atop an invisible incline. The Squee-Gs in one of the side areas. This layout is made of a valley between two inclines. 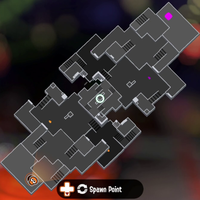 The spawn points are at the top of each incline, with an Ink Cannon (the same as Salmon Run) atop a steep, uninkable cliff on the right side just below the spawn. The cannon nest is flanked by a tall wall, so that an enemy climbing up the slope to reach it has go almost all the way up to the spawn point to get behind the cannon. The stage is dotted with small walls that can be used for cover. The center of the stage has a small hill with another Ink Cannon on it. The base cannons cannot reach each other, but they can reach and be reached by the center cannon. To the sides of the central hill are two tall blocks which can only be inked / climbed from the closer team's side, and can serve as sniper's nests overlooking the center. When an Inkling is occupying a cannon, the are positioned on top of the sphere which makes up the cannon's body. This means that high-accuracy weapons such as Chargers have to aim a little above the cannon to hit the Inkling inside it. When an Inkling leaves the cannon they are dropped behind it relative to the way they are currently facing. In the case of the base cannons, if facing backwards, the Inkling will fall down the cliffside, allowing for a quick escape if flanked. A view from one team's base cannon on to the center area. The other team's base cannon is visible behind the start of the blue cannon shot trail. The splat cam showing the message "Splatted by Cannon!". Standing near an Ink Cannon. Standing on the spawn point. This layout contains a large center area with a glass dome suspended above it. There are also two glass boxes on each side of the stage. These three serve as containment chambers. When the remaining match time is 1:50, a warning will appear saying the side areas are about to seal off. At 1:40, the boxes will descend to seal off the side areas, preventing access to them for the remainder of the match, finally closing entirely at 1:30. Two platforms at the large center area will also descend to ground level, making more room for combat and inkable turf. At 0:55, another message will appear, warning the center area is about to close. At 0:50, the central dome will start descending and by 0:45 it will seal off the center area, finally closing entirely at 0:40. Shortly after descending, a launchpad will appear in the secluded areas, to allow players to get out, only if players from one team remain in those areas, with the color of the launchpad matching that team. Players can Super Jump to the secluded areas if a teammate or a Squid Beakon is inside. Tenta Missiles and the Sting Ray can penetrate the glass barriers, but not the Ink Storm. Sayū no kakuri ga hajimaru! (Sides isolation will be initialized!) Indammingsfase 1 op komst! Sayū no kakuri o kaishi! (Sides isloation start!) Indammingsfase 1 begint! (Containment phase 1 begins!) 1re restriction d’accès enclenchée! Chūō no kakuri ga hajimaru! (Center isolation will be initialized!) Indammingsfase 2 op komst! Chūō no kakuri o kaishi! (Center isolation start!) Indammingsfase 2 begint! (Containment phase 2 begins!) 2e restriction d’accès enclenchée! Zen eria no kakuri kanryō! (All areas isolation complete!) Indamming voltooid! (Containment completed!) Restriction d’accès en place! 1:50 1. Eindämmung steht bevor! (1. Containment arises!) Contenimento livello 1 imminente! (Containment level 1 imminent!) Берегитесь ловушек по бокам! (Beware of traps on the sides!) ¡Aislamiento inicial inminente! (Initial isolation imminent!) ¡Se acerca el primer confinamiento! (1. Containment begins!) Inizio contenimento livello 1! (Start containment level 1!) Ловушки опускаются! (The traps go down!) ¡Aislamiento inicial en curso! (Initial isolation in progress!) ¡Comienza el primer confinamiento! 0:55 2. Eindämmung steht bevor! (2. Containment arises!) Contenimento livello 2 imminente! (Containment level 2 imminent!) Берегитесь ловушки в центре! (Beware of the trap in the center!) ¡Aislamiento final inminente! (Final isolation imminent!) ¡Se acerca el segundo confinamiento! (2. Containment begins!) Inizio contenimento livello 2! (Start containment level 2!) Ловушка опускается! (The trap goes down!) ¡Aislamiento final en curso! (Final isolation in progress!) ¡Comienza el segundo confinamiento! (Containment completed!) Все ловушки опустились! (All traps have descended!) ¡Aislamiento finalizado! Image showing the Dome when closed. This layout contains many obstacles and ramps, making walking around the floor very difficult and providing limited visibility. Above many of the raised platforms, there are floating Grapplinks, which allow players to quickly travel along the higher areas. 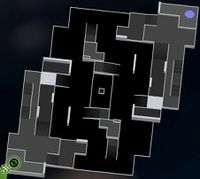 The central area is a high, narrow bridge over a gap, that can only be scaled via a ramp from each team's left flank, a wall on each side near the middle, or using the Grapplinks. It stands between two canyons that separate it from the team base areas. Throwing a bomb or Point Sensor, or using the Sting Ray links the player to the Grapplink. Sting Rays run out immediately once teleported there. 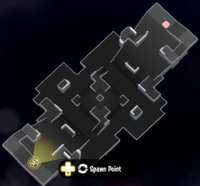 Blocking the right flank of each team's canyon, right before the center area, is a tower with a triangular roof, that seems to be taken from Camp Triggerfish. This layout is laterally-symmetrical like Saltspray Rig. It contains many ramps and long narrow corridors. 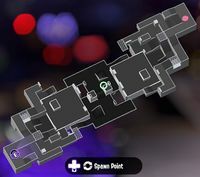 The spawn points are located near each other but separated with a tall glass wall that extends all the way to the center (however, splats against the junction where this wall meets the floor may cause a small amount to leech to the other side). 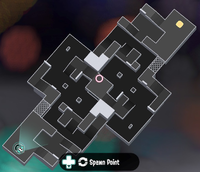 From spawn, is a downhill that leads to the center where are three Ink Switches are placed. The center one rises an uninkable wall in the middle while the two others lift climbable platforms on each side respectively. The platforms, when raised, allow full access to that side's respective home base. Team Alpha (Pearl's team) always spawns on the right side, while Team Bravo (Marina's team) always spawns on the left. However, when the same team is fighting each other in Splatfest, the rule above won’t affect spawn positions, so there is a possibility to spawn on either side. View from the right (Alpha) spawn point. The small courtyard where both team's paths connect. View of the central area from above. The far area and Ink Switches. Reverse view of the entire stage from the end of the far area. The main mechanic of this stage is a large double balance beam scale with a large pad near each spawn point and a pair of smaller pads near the center. The pads are balanced against their same-sized counterparts and are not connected between them. The scales tip based on the number of Inklings and Sub Weapons on them, with the heavier side lowering and the lighter side raising accordingly. While moving up or down a pattern on the top of the pad will glow light blue and a grinding metal sound effect will be heard. Between each spawn point and the larger pads is a lower area with many horizontal and vertical grates and a sponge that can be used to climb back on the left flank. The smaller pads in the middle are each flanked by a pit hazard on the left side and a short ramp providing cover on the right. Sub weapons also affect platform weight. Their weight is half that of an Inkling, which makes the platforms go down by half the distance they would when unbalanced by the weight of an Inkling. 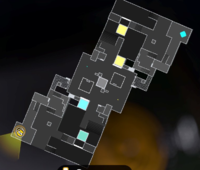 Three Sub weapons don’t follow this rule, being Ink Mine, Point Sensor and Toxic Mist. This is likely due to these subs not having any material value. Swimming on a wall of the platforms counts as being on the platform, and will affect it whether the character is ascending, descending or swimming at a set height. Accordingly, Suction Bombs and Sprinklers (when placed on the walls of the platform) affect the balance by half an Inkling's weight. Certain parts of the bottom areas of the moving platforms are covered by uninkable walls taller than the maximum jump height, so when fully raised, the platforms can only be climbed from certain directions. This layout's main mechanic revolves around tentacles that stick out of the floor. There are three octopus tentacles and three squid tentacles, even during Team Octopus vs. Team Octopus or Team Squid vs. Team Squid matches. The octopus tentacles resemble those that are seen in boss battles, and the squid tentacles resemble a larger version of the Squid Bumpers seen in the Shooting Range. 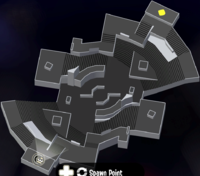 Each team's spawn point is on a raised platform with a lower area in front and to the right and a walkway going off to the left. Past the lower area are a wall numbered 3 on the left, a ramp to a raised platform in the middle, and a tall, uninkable wall to the right. Beyond these is a large courtyard divided by both teams' number 1 walls and an S-shaped inkable platform between them. On each team's side, the number 1 tentacle is on the right, near the S-Shaped platform. Further to the right of each team's side is a small pit hazard and a blocked-off area containing the team's number 2 tentacle. To the left of the team's side of the center is their number 2 wall, and beyond it a small enclosed area. 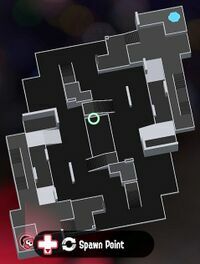 This area contains the team's number 3 tentacle and can be reached by following the left walkway from the team's spawn. The number 2 wall is flanked by a raised platform with Sponges at each end, allowing friendly team members to go around the wall without opening it. The background of this layout features drinking jars with straws filled with a clear liquid. The background also has fireworks going off, some of them in the shape of the squid and octopus icons from the game can be seen in the sky, colored to match the teams currently playing. Players can splat their enemy team's corresponding numbered tentacles (denoted by the Inkling language numbers 1, 2 and 3). Doing so will lower a barrier with the same number, giving access to other areas, displaying a message and playing the "objective captured" / "objective lost" sound effect from Ranked Battle. 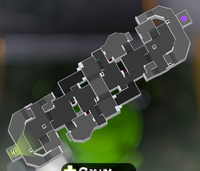 Each tentacle is connected to a certain barrier and they do not heal damage or regenerate once splatted. There is a lighted path on the floor leading from each tentacle to the gate it opens, and once the tentacle is splatted, the lights turn off as the gate opens. 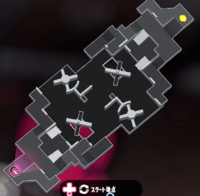 The tentacles do not need to be splatted in any particular order, as number 2 is accessible from the start, and number 3, while hidden behind the number 2 gate, can still be accessed using long-ranged weapons and ones that provide more mobility, such as Inkjet or Sting Ray; or by standing on a Sponge and having it be expanded by an enemy team member. The first tentacle will suffer 600 damage before being splatted, the second 3000, and the third 2000. Certain weapons do more damage to the tentacles, with the game applying the same damage multipliers as when attacking tentacles in Octo Expansion boss fights. The tentacles are unaffected by Object Shredder. No additional damage will be dealt. Dai ___ gēto ga hiraku! (Opened gate #!) Poort # gaat open! Dai ___ gēto ga hirakareru! (Gate # has been opened!) Ze openen poort #! Ours Tor # öffnet sich! ¡Abrimos la puerta #! (We opened gate #!) ¡Se abre el portal número #! Theirs Gegner öffnet Tor #! ¡El rival abrió la puerta #! (The rival opened gate #!) ¡Portal número # abierto! This layout's main mechanic revolves around Splat-Switches. There are 2 switches on each team's side which begin in the enemy's color, and one in the center which begins in a neutral state. The two switches in each team's side control a gate, moving it to a closed position when in the defending team's color, and the central switch controls two platforms in the central area - when it is inked, the platform closer to the owner's color will rise from ground level, making it inaccessible since its walls are uninkable. Each team's spawn point is on a raised platform with a small walkway leading forward. To the right are two lower-leveled areas with staircases leading between them. The lowest of these two levels is split by a wall. The first Splat-Switch is in front of this wall, and the gate it controls is in its middle. Ahead of these two areas is a longer wall separating them from the center of the stage. The second Splat-Switch is on top of this wall, and the gate it controls is adjacent to it (so that when the gate opens it hides the Splat-Switch from the center). To the left is some grating leading to the center from a different angle. The center area is a large, flat, open area, with the central Splat-Switch in its epicenter, with small boxes usable for cover on either side. On each team's right side is a Sponge Block. On the left side is the rising platform, with another small box on top. When the moving platform is raised, it is leveled with the wall on the closer side, allowing players on it to access the base even without opening the gate. Inking the Splat-Switch in the centre. Players spawn on either end of the stage, on raised platforms that lead down to sequentially lower platforms with boxes and a bumper. This areas can be accessed by falling through grates, jumping on bounce pads or falling from one raised platform to a lower one. In the center, is a raised platform with boxes in the middle that can only be accessed by jumping on the bounce pads from each side, and grate bridges from the sides of the center. The bounce pads are placed above pit hazards, providing access to higher areas at the risk of falling off the stage. This layout contains Ride rails that lead to the middle which is the only way to get to the center. This layout contains Dash tracks. 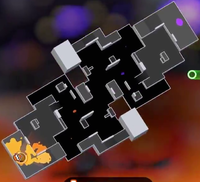 This layout contains Sponge Blocks and six "Free Splat Zones"
These zones operate like Splat Zones in that inking a certain percentage of them causes the entire zone to be filled with the team's ink. This layout contains four small and one large Splat Switches, called "Nuri Switches" in Japanese, which control ten moving Spreaders. 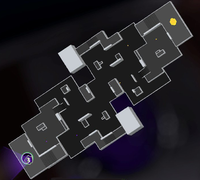 This layout contains an Ink Switch in the center of the map controlling a strip of 14 moving platforms. 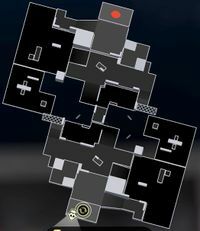 These platforms, partially separated by a glass wall in front of the switch at the start of a match, serve as the surface for the center of the map. When the switch is in use, the platforms move slowly from one end of the stage to the other. Players must ink the surface of the platforms before they slide under the other glass wall behind the switch, putting the turf out of reach for the remainder of the match. The switch is covered with a glass barrier from all sides, except for the front. The height of the switch is also enough that the Tenta Missiles is less likely to activate it. When the last surface is fully on the other side of the first glass wall, sliding doors of the glass barrier conseal the front of the switch. Marina claims to have helped make the stage herself, which is shown by her symbol appearing on the stage image. As Marina mentions often in the news segments, she was raised around Octarian machinery, which would explain why many of the Shifty Station variants contain at least one of the Octo Valley / Octo Canyon stage gimmicks. This is elaborated on further in Octo Expansion. In Marina's chat room, Pearl mentions how Marina creates these stages all by herself, while Cap'n Cuttlefish notes the Octarian technology used, such as floating rocks, from Marina's time as a combat engineer for DJ Octavio. 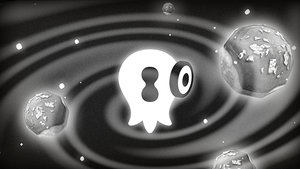 The stage seems to be set somewhere in one of Octo Canyon's domes or Deepsea Metro, as can be deduced by the decorations scattered throughout the stage types as well as the floating objects in the background. Not all Shifty Stations actually shift. Layouts 3, 7, 9, 14 and 15 are static, and 10, 11, 12 and 13 only move when interacted with. 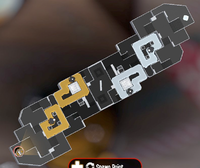 On one of the "Stations" there is a inkjet glitch that allows you to clip through the wall. 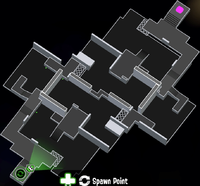 Layout 3 has been used for the most Splatfests, with a grand total of 5. The internal code name for this stage in the game files is "Deli". Deli18 Dozer x This layout contains Flooders, called "Octo dozers" in Japanese. 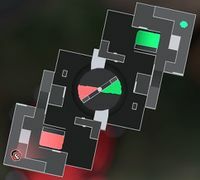 x This layout will contain Sponge Blocks and six "Free Splat Zones"
Layout 14 didn't have the ambient sound playing in the background that can be heard in the other Shifty Station layouts in Recon mode. This page was last edited on 22 April 2019, at 05:18. This page has been accessed 68,291 times.